Whole-yeast-cell ELISA demonstrating the serological response to immunization with intact heat-killed Hc. Preimmune serum was obtained prior to immunization. The hyperimmune serum was taken 2 weeks after the fourth immunization. The sera were serially diluted in blocking solution. For comparison of preimmune and immune sera for each isotype, *P < 0.01 and **P = 0.018 by Student’s t test. 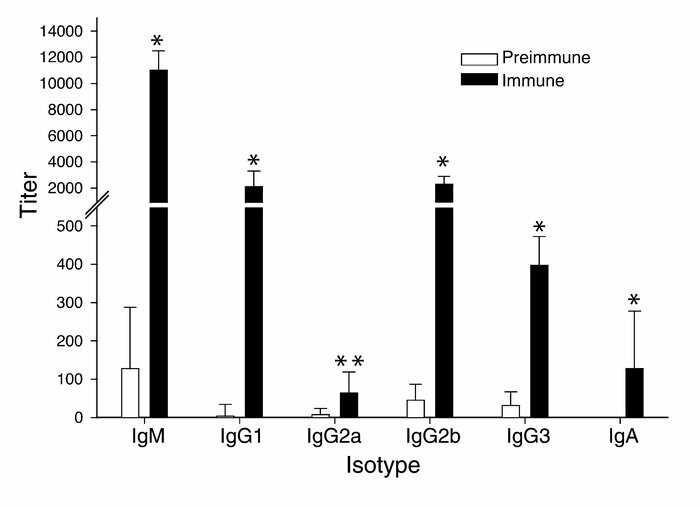 The results were from the mouse with the strongest immune response, but results were similar in all mice.